I'm excited about the new Christmas card, I'm going to share with you today. It turned out beautiful! I love to combine different stamp sets to create a card. 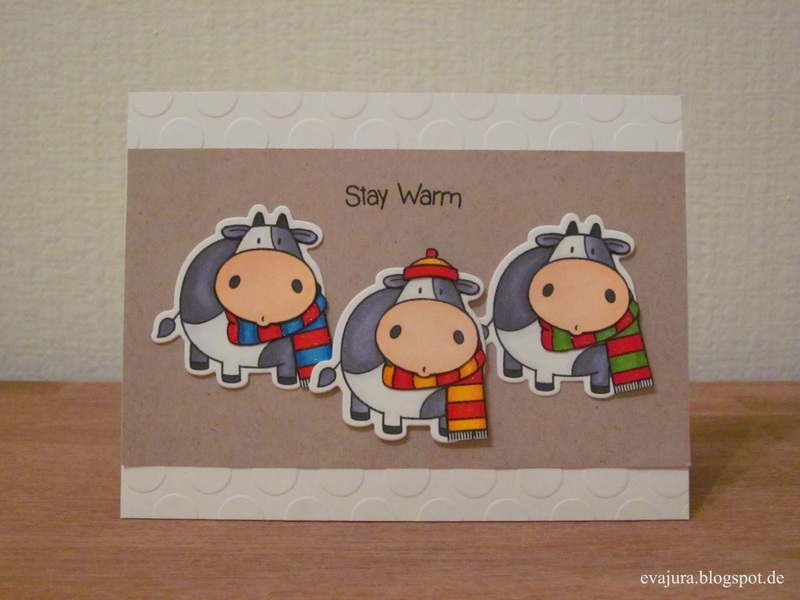 This time, I chose the Cool Day and The Whole Herd stamp set by My Favorite Things. 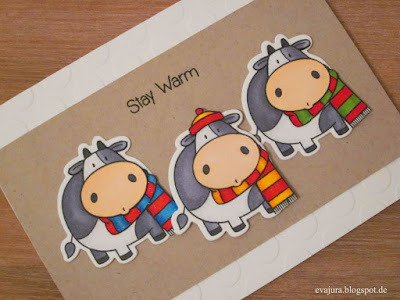 All you need is just the scarf and the hat image from the Cool Day stamp set, the super cute cow from The Whole Herd stamp set and of course some Copic markers to color the sweet images. Stamp all the images in Memento Tuxedo black ink onto some Neenah solar white cardstock and Copic color them. After your coloring is done, cut out the scarf and the hat with your scissors. You might use the matching die to cut out the cow. You will also need to stamp each cow twice, since the cow's heads have to be cut out with your scissors. To finish your card, you are going to need your clear Wink of Stella glitter brush. Apply the glitter to the scarfs and the hat. I hope, you like the tutorial today. Thank you for coming by and reading my blog! Such a fun card! Thank you so much for joining us at the Simon Says Stamp Monday Challenge Blog!! 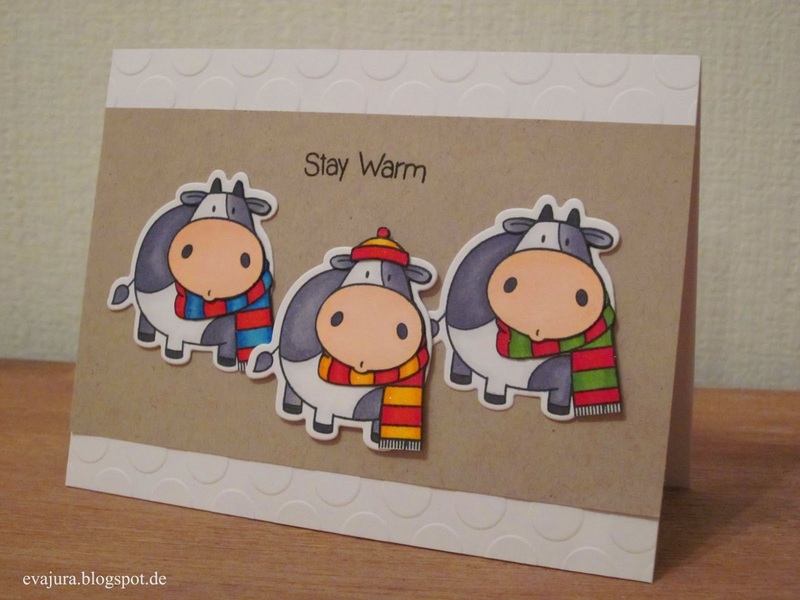 Thanks for showing your funny cow-card for paperminutes this week. Gorgeous card Eva! I absolutely love those cows they are so cute. Was für eine geniale Idee, die beiden Stempelsets zu kombinieren! Deine Winterkühe sehen wunderbar kuschelig und witzig aus. 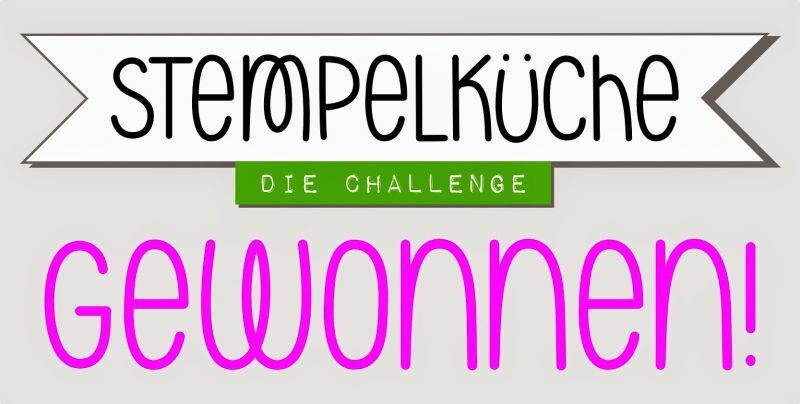 Vielen lieben Dank für diesen weiteren Beitrag zur aktuellen Stempelküche-Challenge.